1 Kyrie Deus creator omnium Sarum Chant 2�20"
6 Myn hertis lust 2�16"
8 Mi verry joy 3�43"
9 Alas, alas, alas (Walter Frye) 3�22"
10 So ys emprentid (Frye?/Bedyngham?) 2�49"
11 Pryncesse of youthe (Anon) 2�27"
12 Kyrie Omnipotens pater 4�32"
Another very well-presented disc from Signum, this intriguingly titled recording in fact presents music found in a manuscript in the Royal Library in Brussels, where it bears the shelfmark 5557. Edward Wickham's approach to this sort of repertoire is scholarly, and his article about the manuscript and its contents in the booklet accompanying this disc is thorough and informative. The music itself is of English provenance with accretions of music by Northern European composers, added over the years. This recording selects only English works, centred around two Masses; one by Walter Frye and the other by the monoglot Plummer. Both are works dating from the 1470s or 1480s so this is music from the crossover period between the Mediaeval and the Renaissance eras. In feel it has much more of the mediaeval about it. 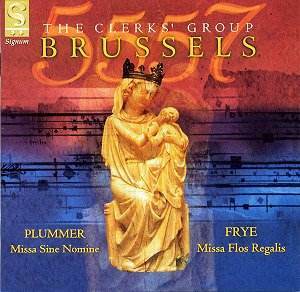 The seven singers who make up The Clerk�s Group for this recording present few surprises to anybody familiar with the English early music singing scene, and this is possibly the reason for this disc�s main drawback. Overall, while the music is beautiful, if austere, the end-result tends more towards being merely cold. There is something dispassionate and slightly removed in the performances. This may be the result of employing singers more versed in the renaissance than in the mediaeval end of the repertoire. The Clerk�s Group does not employ an unchanged group of singers, as does, for example, The Hilliard Ensemble. The comparison with that group is not chosen at random, as The Hilliard Ensemble have recorded repertoire from this same period over a number of years. There the benefits of a constant personnel really do show. The sense of �ensemble� - that intangible gelling of the individual voices into a whole greater than the sum of the parts - is largely absent in these performances. Whether this detachment in the sound is something that Edward Wickham deliberately seeks is not clear. The further result of this situation is that, throughout the disc, intonation sounds distinctly unsettled. [Sample 1] It is not that things are "out of tune" for tuning in this music is a highly variable feast; it is more that it sounds like the singers are not exactly sure where in the sound they are meant to be aiming for. The otherwise excellent booklet notes tell us much about the origins of the music and credit Lucien Jenkins for advice on pronunciation of mediaeval English, but nowhere is it mentioned at what pitch this music is being sung, nor, more importantly, in what manner of tuning. At this period one would expect unaccompanied vocal music to be sung in "just intonation" - i.e. employing as many �perfectly� tuned intervals as possible. Certainly the octaves and fifths should be expected to be not only more pure than they frequently are, but, more importantly, to be accurate in pitching. Too often a note is sounded, and then wobbles in intonation, giving the �unsettled� effect mentioned above. [Sample 2] Maybe part of this stems from the period pronunciation. Its accuracy is something on which this writer is not qualified to comment, but the vocal result is a lot of very �flat� vowel sounds (the opposite of �bright� vowels) which do lead to instability in pitching. The most obvious culprit in the above (possibly because of his position at the high end of the pitch texture) is the countertenor William Missin. Again, a comparison with the Hilliard Ensemble is telling, for when one listens to David James, countertenor of that quartet, sing this period of music, the impression is always one of effortless ease of production and graceful shape of phrasing. In short James makes it all sound easy. In comparison Missin makes too much of this music sound like hard work. The somewhat nasal production is presumably deliberate and may be justified by historic evidence, but frankly it is not a very pleasant sound to listen to. [Sample 3] This manner of production gives the listener the same feeling as the awful �hooty� countertenor sound popular in the 1960s. Interesting music here, and well presented, but as a listening experience this one is just too uncomfortable to bear repeated hearings.